Call SERVPRO at the first sign of water damage to restore your property. Flood damage can devastate your property and leave you feeling isolated but contacting the right experts in Alabama is crucial to ensuring you minimize further deterioration to your property and give yourself the best chance of a successful restoration. Floods are a recurring problem for residents of Prattville, and the water damage they leave behind is heartbreaking for property owners, whether it is your family home or your business that is affected. It could be hard to recover from an event of this nature but having the best help available at your disposal can make all the difference to the quality of the restoration work. Our truck mount can extract 36,000 gallons of lost water per day compared to around 30 gallons per day with a dehumidifier; demonstrating the importance of the initial physical extraction. A liquid is straightforward to remove than moisture from the air. You can minimize the damage by getting in contact with an expert from SERVPRO as soon as possible is crucial to minimize the damage to your property. As well as industrial strength pumps our technicians use wet/dry vacuums significantly reducing drying time and preventing secondary water damage. It is much more efficient for our experts to remove water in its liquid form, in fact, its 1200 times more efficient, so the faster you contact SERVPRO after an emergency the higher your chances of achieving a successful restoration for your property. Our experts can remove lost water no matter where it is, whether it is in liquid form or evaporated into the air causing humidity; however, leaving any lost water to sit risks allowing it to spread to as yet unaffected parts of your property, as well as soaking deeper into furnishings and the structure of the property itself. Our response times are second to none, and we treat every incident as the emergency it is for you. With our wealth of hands-on experience you can feel safe with us, as our technicians manage the entire restoration process for you. 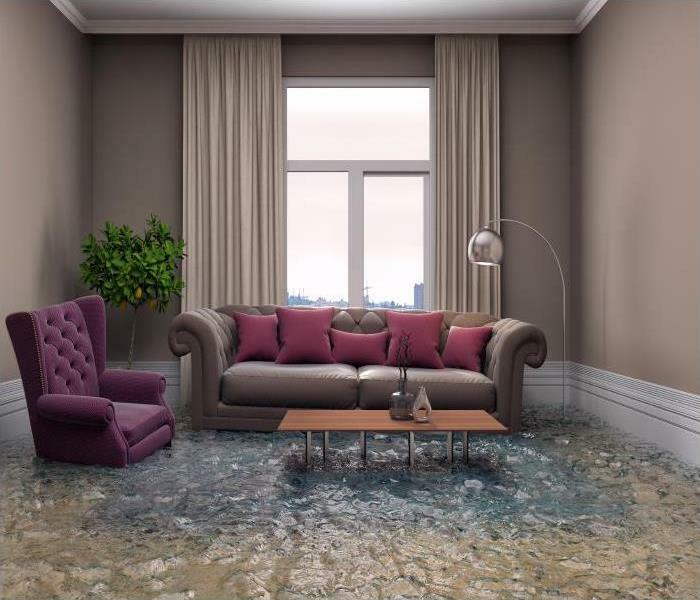 If water damage has affected your property, contact SERVPRO of Prattville, your local experts in water restoration, 24/7 at (334) 358-1186. Learn more about Prattville here. SERVPRO of Prattville knows dealing with flood damage can feel overwhelming. This area of Montgomery county experiences flood damage occasionally due to our proximity to the Tennessee River. When water intrusions happen, even a little can saturate flooring, soak up into drywall and bring secondary issues such as toxins, mold and foul odors. When SERVPRO receives an emergency call to clean up flood damage in Prattville, our team gets to work quickly. During the initial phone call, your situation is handled with professionalism and compassion for what you are experiencing. 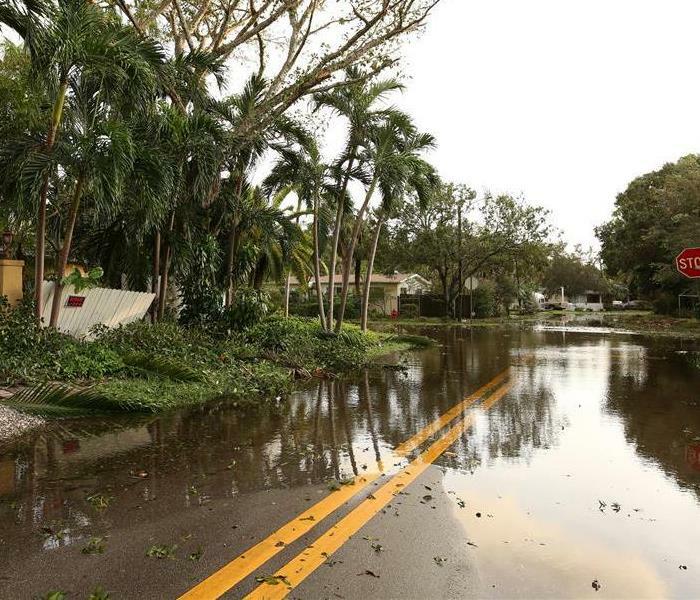 Our certified technicians know flooding in a home is life-altering, and our goal is to assist homeowners in returning their homes and lives to normal. Why SERVPRO? Flood water in your home requires fast action. Our local emergency response teams arrive within a few hours of your initial call and begin accessing the damage. The green service vehicle has the equipment and supplies to start remediating the water damage immediately. We can handle any size water loss situation. For large scale water extraction, we have truck mounted pumps that can remove thousands of gallons of water quickly. Proper drying of a home after water extraction is more than just setting up fans. Our technicians set up the air movers at angles to move moist air up and out. Each set up is unique to the area we are drying. Particular attention is paid to areas where water may have been absorbed such as behind drywall. Weep holes are drilled if needed to allow for adequate air circulation to dry behind walls and ensure complete lowering of moisture levels to inhibit mold growth. Possessions that are saturated may be dried on site or packed up and dried in our special facilities using our proprietary methods. SERVPRO of Prattville knows dealing with flood damage can feel overwhelming. Call us at (334) 358-1186 and speak with one of our certified technicians. Our emergency response technicians are available any time you call 24-hours a day to clean, dry and deodorize your home and contents to their preloss condition. Click here for more about Prattville. What is a Puff Back and How Can it Cause Fire Damage to Your Wetumpka Home? Inspect your furnace annually to help prevent possible fire damage. Not all fire damage we tackle comes from an actual fire. 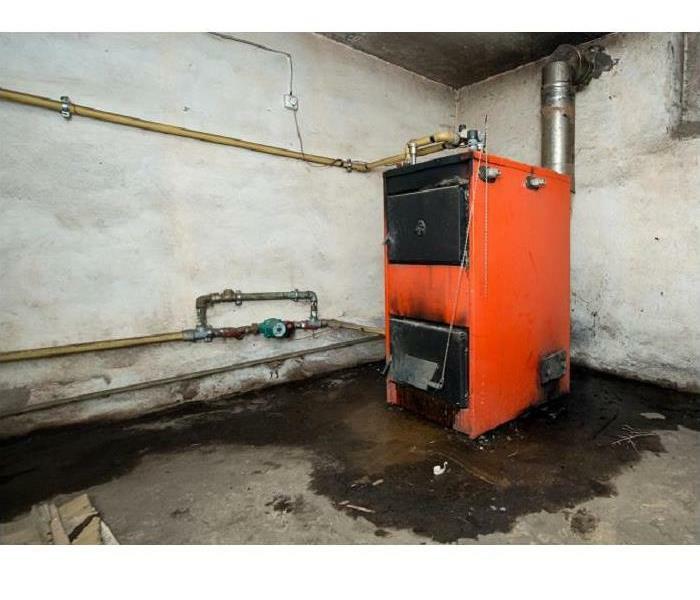 Puff back is a malfunction of an oil-burning furnace that sends soot and residue all over walls, ceilings and any objects in the path of the spew from the unit. This situation often occurs after the furnace has been off for some time and then turned back on and fails to ignite initially. Vapors build up in the ignition chamber, and when the spark from the igniter attempts to light, soot and oil residue blow through the exhaust system into the home. Anywhere this is a register has the potential to spread the soot throughout the home. When SERVPRO remediates a Wetumpka home for fire damage type issues after a puff back, our technicians first determine where the soot and residue have landed within the home. The soot damage can range from light particles that are barely visible on countertops to oily dark streaks and solids that resemble a spider's web, and then there is the smell. The odor left behind is unpleasant and needs eradicating. Damage from a puff back should never be cleaned up on your own. Soot particles can be unhealthy to breathe, and the home requires professional cleaning. SERVPRO technicians have both the knowledge and equipment such as HEPA filtered air scrubbers in tandem with activated charcoal filters to remove the odor-causing particles from the air. Technicians hand-clean restorable items using professional-grade cleaners and wet and dry sponge techniques. SERVPRO has certified Odor Control Technicians (OCTs) experienced in removing foul odors from homes, and they have numerous resources at their disposal. Thermal fogging is a very effective way to neutralize foul odors left behind by a puff back. The OCT uses a fogger to deliver a hot vapor that works much like smoke and penetrates porous objects to eliminate the odors and leave no trace of the smoke or soot odor. A puff back is just as dangerous as fire damage and should be professionally cleaned up as soon as possible. To get started, call SERVPRO of Prattville at (334) 358-1186, and one of our expert technicians can begin the process to turn back the clock on the damage to your home and make it "like it never even happened." Read more about Wetumpka here. Is Mold Growing in Your Tallahassee Bathroom? High moisture levels in bathrooms provide the right environment for mold growth. Showering in a tiny bathroom can be awkward due to the lack of space, but the problem can become significantly worse if a lack of proper ventilation causes mold damaged inside it. When steam builds up in the bathroom as the shower runs, it is usually taken care of by a fan in the ceiling. However, a broken fan or incorrectly installed ventilation causes excess moisture to linger. As family members take showers, the leftover steam and condensation can cause mold damage inside of your Tallahassee bathroom. 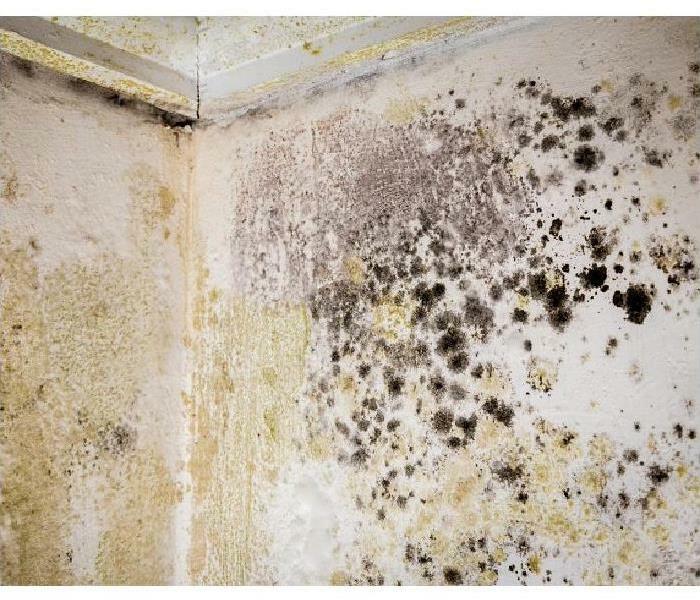 You may begin to smell the musty odor before you see the mold, or you may spot it blooming on the wall. However, the way you detect the mold is not relevant; what is essential is that you contact us for help as soon as you do find it. Here at SERVPRO, we're known for three key factors which make us the ideal company to work with during a damage crisis inside of your home. Our technicians are excellently trained, we always come to your home with advanced technology designed to fight the damage inside, and we pride ourselves on our fast response time. At SERVPRO, We're Faster to Any Sized Disaster. Once our techs arrive at your home, they can launch right into investigating the damage and developing a remediation strategy. During this period, SERVPRO can determine which techniques may be necessary to remediate the mold damage and what should be done to ensure that the process goes smoothly. As the mold damage is still in the very early stages of development, we can block off any vents and then begin the remediation. SERVPRO can use a disinfectant to clean the mold damage from the surface of your bathroom walls. We can also use an antifungal agent to ensure that mold does not regrow. From there, we can advise you on how to fix the ventilation problem in your bathroom, before leaving your home to you in its preloss condition. After you find mold in your home, always call for help as soon as you can. Speak with SERVPRO of Prattville by phoning (334) 358-1186. Night or day, we're ready to come to your aid. Read more about Tallahassee here. When a storm devastates your business our experts are ready 24/7 to help you with your restoration needs so you can get back to business. As many diners are, your Wetumpka business stays open to hungry patrons all night long. While there are rewards to this availability, especially after other area eateries have closed up for the evening, it does not leave much time for cleanup and maintenance of the building. This situation is even more pressing when natural disasters like flooding occur in the area and affect the diner, as you have to react quickly to the situation to keep both your employees and potential customers safe. Once the building has gotten cleared, you need to address the flood damage that has occurred within your Wetumpka diner. While many business owners might strive to take care of these effects on their own to save money and get their doors open quickly, contamination is a serious concern when natural flooding has occurred to the structure. 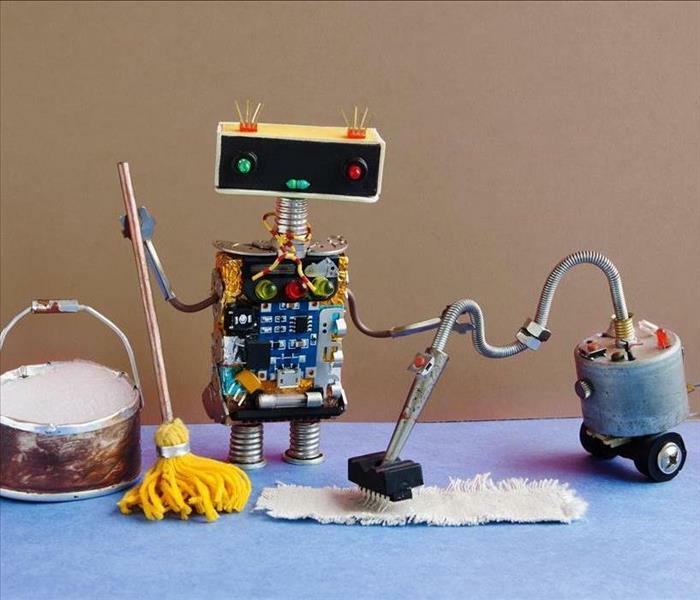 Potential bacteria, sewage, and chemicals could all adversely affect structural elements as well as your equipment, not to mention, provide an ideal breeding ground for mold spores to colonize. Our SERVPRO professionals have a 24-hour response time, making our team available whenever disaster strikes to offer effective mitigation strategies and protect the equipment and contents of your diner from irreparable damage from rising waters. Our mitigation begins with fast extraction techniques utilizing our truck-mounted pumps that arrive with our Green Fleet of response vehicles. Once the excess water has gotten removed, we can assess damages and begin preparing for drying efforts. After the pooling water has gotten removed, our Contents Department can work to remove at-risk equipment and electronics from the area that could become severely damaged by the moist environment. With black water flooding, it is customary to remove all exposed materials entirely to prevent continued contamination or spread of bacteria. Our licensed contractors can seamlessly transition to rebuilding your diner quickly once mitigation work completes. There are many steps to recovering your diner once flood damage has occurred, but our SERVPRO of Prattville team offers comprehensive support and restoration that helps to get your doors back open as quickly as possible. Give us a call anytime at (334) 358-1186. The City of Wetumpka is dedicated to minimizing the loss of life that is associated with floods click here for more information. When you find mold in your home don't panic help is near, call our trusted professionals so they can get started on restoration as soon as possible. Few Tallassee homeowners think of mold when someone says anything relating to home disasters. Active mold spore infestations do not leave everything underfoot wet, and they do not generate heat and smoke. Even so, this quiet disaster costs homeowners millions of dollars every year in restoration and replacement expenses. It is almost like mold tailored its effects for the quiet, Alabama life we enjoy here. Eliminating Tallassee mold damage means finding and destroying every active mold spore, cleaning all viable surfaces, and disposing of anything past the point of restoration. SERVPRO cleanup and repair teams follow a method that has helped our company return thousands of homes to their owners in a clean, safe condition. First, we seal off the infested area of the home. Team members use heavy, plastic sheeting to cover windows, air vents, doorways, and other points of entry and exit to isolate the mold and prevent any active spores from getting into other parts of the structure. Our next step is to determine the extent of the infestation and the type of property affected. The property falls into three categories, which tells inspectors what tools and chemicals are needed to destroy the spores and remove them from porous, non-porous, and semi-porous property. Porous property, such as upholstered furniture and drywall panels, we first wipe down with a dry sponge and cleaning cloths. If the mold damage layer is thick, technicians have the option of using mild cleaners to break them up for easier removal. Carpets are also porous, so SERVPRO specialists have the option of using a vacuum with a HEPA filter designed to capture mold spores and remove them. Non-porous property is items like marble countertops and metal refrigerator cabinets. For these items, dry sponges and a mild cleaner often take care of the problem. For thicker layers, technicians can use a stronger, anti-fungal cleaner to break them up and remove safely. Semi-porous property includes brick and concrete surfaces such as fireplaces and patios. Removing mold is more difficult and may require team members to use stronger cleaning agents and stiff brushes to work all spores loose from cracks and seams; they follow-up with vacuums and HEPA filters to capture all loose spores. The process to remove mold is not a simple one, but SERVPRO of Prattville takes every action needed to make your home safe again. If you need us, call (334) 358-1186 today to schedule an inspection or bring in one of our restoration teams to get started. Check out the progams at the libray click here for more details. Our team has the right equipment to remove soot and smoke damage after a fire. Disasters do not impact your Elmore home at a convenient time, but when they do, you need assurances that professional restoration technicians can arrive quickly to help. In the event of a fire, you have a finite timeline to protect the at-risk items in your house from becoming irreparably damaged from soot, smoke residue, and other potential contaminants. Our professionals are available 24/7 to provide fast response to emergencies like fires to be ready for mitigation and restoration solutions whenever first responders have left the premises. 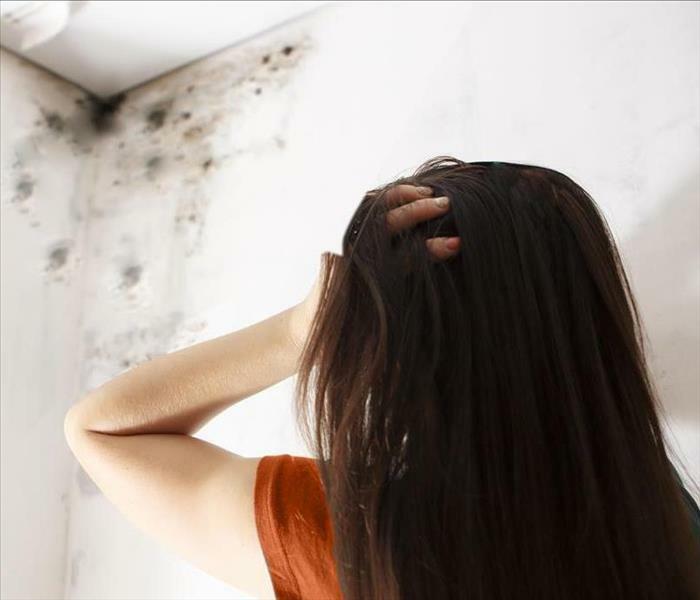 Fire damage can affect your Elmore home in many ways, and structural elements can often take the worst of these effects from soot and smoke damage to full failure. Finding a way to restore this widespread damage can be challenging, making professional restoration the wise choice to return your home to its original condition. Our SERVPRO professionals are available 24/7 to offer effective mitigation and restoration solutions for those affected by structure fires. Our team works closely with the major and local insurance companies to provide them with the documentation and photographic evidence that they require to approve a damage claim on your home. We understand what these adjusters require through our full inspection of the property, and can offer an estimation quickly to expedite the claims process and get the work started on your home as promptly as possible. Providing peace of mind in the earliest stages of fire damage recovery is an important service that we offer, and that begins with our fast response and our expertise to begin helping the situation improve right away. Give our SERVPRO of Prattville rapid response team a call at (334) 358-1186. Residents and guests have a variety of avenues for fun, relaxation and learning at the fingertips click here for more information. If you ever notice a fungus growing inside your place of business, call SERVPRO of Prattville at (334) 358-1186 24 hours a day and seven days a week. If a small water leak ever develops inside your carpet warehouse in Tallassee, your contents could get negatively affected. If organic materials stay wet for too long, you may find yourself with a commercial mold damage situation. Once a fungus starts to develop, it quickly forms structures called hyphae that grow into, out of, and around the contaminated material. The hyphae not only make the contamination larger, but they also produce microscopic, seed-like spores that enable the fungus to reproduce. These small spores float around in the air until they find other wet materials to settle on and cause your company commercial mold damage in places far away from the initial source. When dealing with the storage warehouse for your business, our SERVPRO technicians know that mitigating problems with your contents can save you and your insurance company money and time in the long run. Once commercial mold damage inside your Tallassee warehouse is found, we take measures to prevent it from spreading and causing multiple issues. Porous materials in your warehouse can be locations where spores sit until they get activated by moisture someday in the future. Organic substances like paper or cardboard in your warehouse can be prime locations for microbial growth if they get wet at a later date. 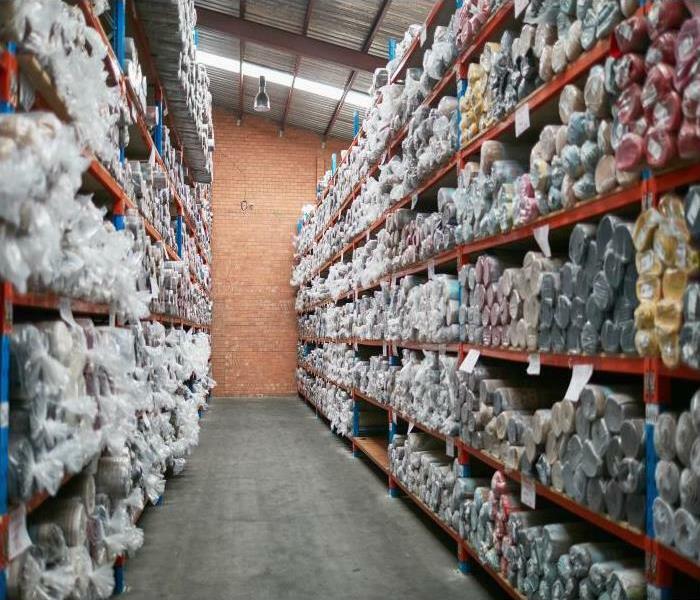 If any water is not removed quickly after a leak, many microbes that exist can activate and contaminate various items and building materials in your warehouse. If our SERVPRO crew knows that you have porous contents that could have been contaminated, there are numerous steps we can take to help prevent future growth. Any porous substances that get affected by spores get sprayed with antimicrobial chemicals. These chemicals aid in eliminating mold growth as well as the spores created by the contamination. In some cases, we use foggers to eliminate microbes and foul odors that exist inside your porous materials after fungi have formed. Click here for more about Tallassee. While many are still reeling from the unexpected severe weather event that took place recently in Wetumpka, the clear path of destruction from the tornado left many homes and businesses in dire need of reconstruction and restoraåçtion efforts. Our team responded quickly to the emergency and continued to offer aid for those affected by the storm with the full measure of our expertise, equipment, and personnel. One of the areas where we can be of immediate service to affected Wetumpka properties is assessing and reconstructing storm damages from the tornado. We have a team of licensed contractors with years of experience that can determine what must happen to restore a home damaged by this F-2 tornado. In addition to reconstruction and remodeling services, we still offer the same emergency restoration options that have afforded us our reputation throughout the area. Our SERVPRO Green Fleet remains ready and able to help properties affected by this devastating storm by offering fast response times with the equipment and experienced technicians to make a difference. It is more than a slogan to say We’re Faster To Any Size Disaster. By working swiftly, we can salvage contents and personal possessions and treasures. We do our best to save your irreplaceable photo albums with a freeze-drying process to curtail degradation until dried--lyophilization at our facility. Part of recovering from a storm event like this is working with insurance companies to get reconstruction efforts started immediately. Our SERVPRO professionals have worked closely with both local and major insurance providers and established relationships that allow our team to know what documentation and evidence are necessary to file a damage claim and get it approved quickly. Our office staff is skilled in the Xactimate software program to ensure an accurate final summary of charges and to work within the prescribed budget established by your insurance adjuster. 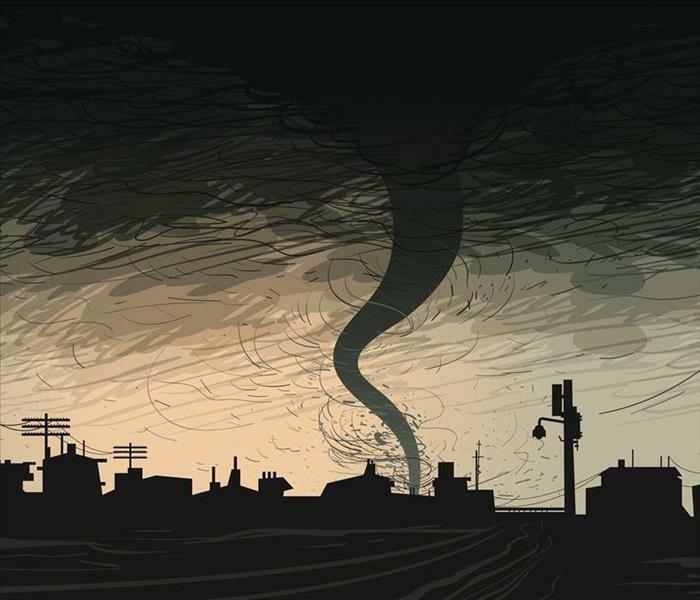 We recommend that you immediately call your agent to verify the damage after a natural disaster such as a tornado. While the tornado that affected the area recently was unexpected and devastating to the town, efforts are already underway to repair the damages. For your home, you can rely on our trusted SERVPRO of Prattville professionals to arrive fast with the equipment and expertise to help. Give us a call today at (334) 358-1186. Why SERVPRO for Water Extraction from Carpets in Wetumpka? We Have the Equipment and the Technicians!! 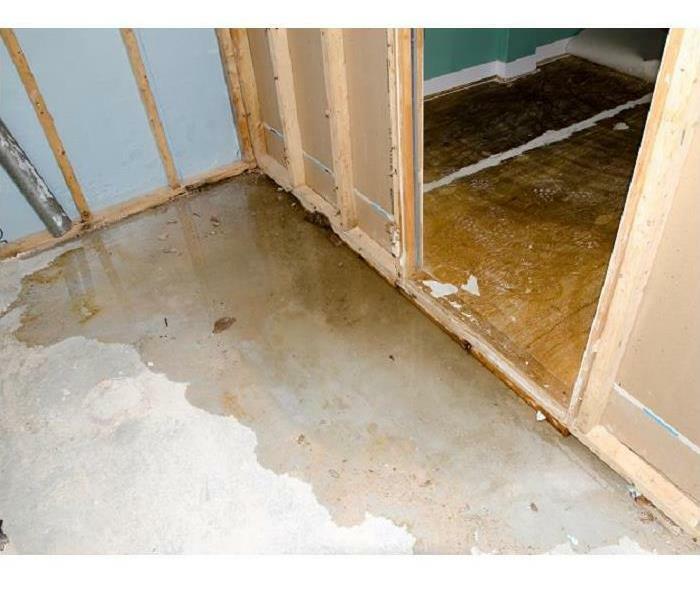 When water spreads through Wetumpka structures, the effects can run from simply annoying to stripping out carpets, floors, walls, and more. Much of the damage depends on how high the water rose and how long it remained in place before a professional company can remove or extract it. Clean water and Black Water from exterior flooding present different methods.. So why choose SERVPRO for water extraction in Wetumpka? You don’t need us to clean the full-size replica of the Temple of Hera, but for area homes, no other local agency has our experience or our access to a nationwide network of equipment, cleaning agents, and training. Extraction is the third of six steps we take to restore every home after water damage. Before our technicians bring in the equipment needed to get the water out, they have to establish contact with the owner and perform an initial assessment of the damage. Now, SERVPRO restorations teams use a combination of devices to remove and extract the majority of water inside the home. For clean, standing water, that means one of the various sized, commercial pumps we keep on-hand. For most homes, our technicians can remove it within a day. For water trapped in carpets or between wooden floorboards, they switch to smaller devices called extractors. For hallways, closets, and small areas, team members use handheld wands. In larger rooms, they have the option of using self-propelled extractors that have a platform which allows the technician to stand on them while under operation. We call these devices Rovers. With both types of devices, operators can adjust both the vacuum speed and applied heat. The option lets them reduce the amount of time needed to dry the carpets and floors without accidentally damaging either. After completing extraction, our team members can then move on to the final three steps needed to restore area homes. Drying property and lowering the inside humidity level, cleaning and repairing personal and structural property, and restoring items not severely damaged by the water. The process to restore Wetumpka homes is not quick or easy, but SERVPRO of Prattville is here for you. Our specialists carefully go over every step to ensure you are confident in our ability to return your home to you in its original condition. To get started, call us today at (334) 358-1186. 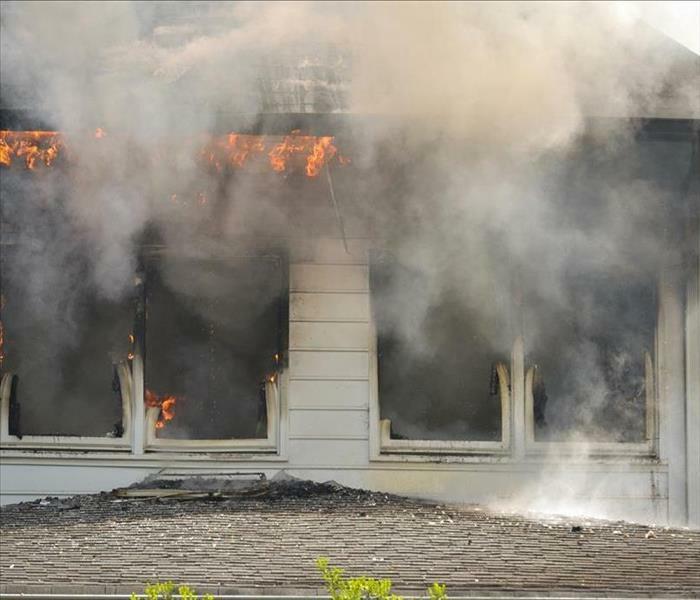 3/19/2019 - What is a Puff Back and How Can it Cause Fire Damage to Your Wetumpka Home? 3/5/2019 - Is Mold Growing in Your Tallahassee Bathroom?